Acetone is the substance dimethyl ketone which has the formula CH3COCH3 or C3H6O. Non-acetone is usually the substance ethyl acetate which has the formula C4H8O2. Acetone is a chemical substance known as dimethyl ketone which has the formula CH3COCH3 or C3H6O and is a solvent commonly used to remove nail varnish. Acetone is a liquid that is colorless and a simple type of molecule known as a ketone. It is a flammable substance though, which does have a rather distinctive odor. The molecular weight of acetone is 58.08 g/mol. Acetone can be recognized by the smell that it gives off, and that can be described as being like fruit. In industry, the acetone can be made by a process known as the cumene hydroperoxide method. 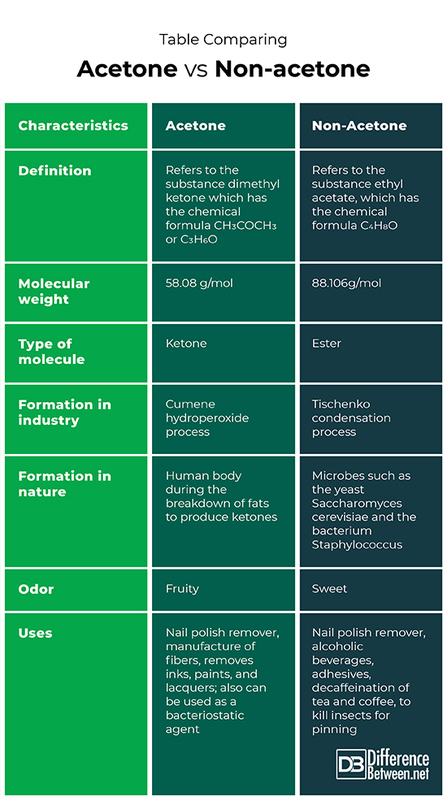 Acetone is also made in the human body as a byproduct of the breakdown of fats and conversion to ketone bodies. It is formed in large amounts in people who have uncontrolled diabetes with ketoacidosis. Acetone is a substance that is often used in the cosmetics industry to remove nail polish and it is used to also strip paint. Acetone is used as a solvent to remove lacquers and inks, and it is often used to make artificial fibers. It has also been shown to inhibit the growth of bacteria such as Aerobacter aerogenes, and so can be used as a bacteriostatic agent. Acetone is relatively safe to use provided that sufficient and adequate precautions are taken when using it and it is used in very small amounts. This is because the vapors that are given off can be very irritating to both the eyes and various mucus membranes. If spilled on the skin it can cause some irritation and dermatitis. It is also important to remember that it is a flammable substance so care should be taken not to use it near an ignition source. Non-acetone is the name most commonly used to refer to the chemical ethyl acetate which has the formula C4H8O2 and is used as an alternative instead of acetone in nail polish remover. The molecular weight of ethyl-acetate is 88.106g/mol, and it is a clear liquid that has no color. It does also have a distinctive sweet smell to it that has been described as being like that of a pineapple and it is a flammable substance. 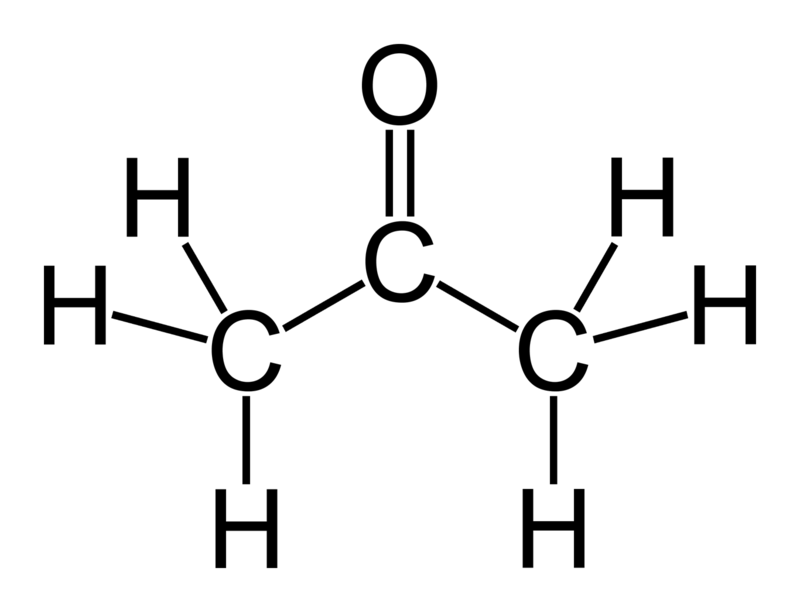 Ethyl acetate is a type of molecule that is known as an ester, and it is also a flammable liquid. Ethyl acetate can be manufactured commercially by a method that is called the Tischenko condensation reaction. It can also be made by the esterification of acetic acid and ethanol and is formed by several different microbes including the yeast Saccharomyces cerevisiae and the bacterium Staphylococcus. There are many uses for ethyl acetate including use as nail polish remover. It is also used by entomologists to kill insects for pinning purposes since it keeps the insect body reasonably pliable and easy to manipulate. It is also used in the alcoholic beverage industry but can spoil wine if the concentrations of the ethyl acetate are too high. This substance is also used to remove the caffeine from tea and coffee. Non-acetone (ethyl acetate) is a useful solvent that is also found in many adhesive products. Ethyl acetate can be dangerous if people are not careful and are exposed to large amounts. The substance can cause irritation to the eye and can result in actual eye damage. It can cause irritation to the breathing passages and can cause a headache. This is also a very flammable liquid that should not be exposed to any type of ignition source. Difference between Acetone vs. Non-acetone? Acetone is the substance that is also known as dimethyl ketone that has the molecular formula of CH3COCH3 or C3H6O. Non-acetone is the substance that is also known as ethyl acetate that has the molecular formula C4H8O. The molecular weight of acetone is 58.07 g/mol. The molecular weight of non-acetone is 88.106g/mol. Acetone is a molecule known as a ketone. Non-acetone is a molecule known as an ester. The cumene hydroperoxide process is used to form acetone in industry. The Tischenko condensation process is used to form non-acetone (ethyl acetate) in industry. Acetone is formed in the human body during times when fats are broken down to produce ketone bodies. Ethyl acetate (non-acetone) is produced by microbes such as yeasts and certain bacteria. The odor of acetone is usually described as fruity while the odor of non-acetone is described as sweet. Acetone can be used as a nail polish remover, to remove inks, paints, and lacquers; to manufacture fibers and for use as a bacteriostatic agent. Non-acetone can be used as a nail polish remover, in alcoholic beverages, adhesives, for the decaffeination of tea and coffee, and to kill insects for pinning. Acetone and non-acetone are chemical substances which are both solvents. Both substances can be used to remove nail polish. They both have a distinctive smell but the aroma of acetone is described as being more fruity and that of non-acetone, sweeter. Acetone is a ketone that is a colorless and flammable liquid. Non-acetone is ethyl acetate, an ester that is also a colorless and flammable liquid. Dr. Rae Osborn. "Difference Between Acetone vs. Non-Acetone." DifferenceBetween.net. March 18, 2019 < http://www.differencebetween.net/science/difference-between-acetone-vs-non-acetone/ >.